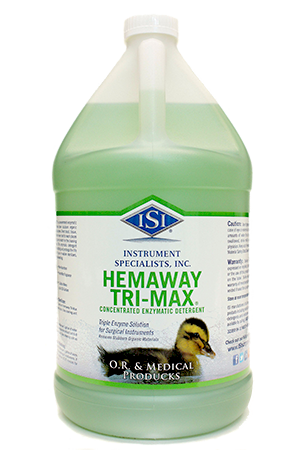 reach places such as box joints and tubing, are no match for the cleaning power of Hemaway Tri-Max. This enzymatic detergent greatly reduces the need for scrubbing and prolongs the life of your instruments. Ideal for use in washer sterilizers, washers, ultrasonics, and manual washing. per 1 gallon of warm water. Directions and Information printed on bottles label.